In Italy they are a superstitious bunch. 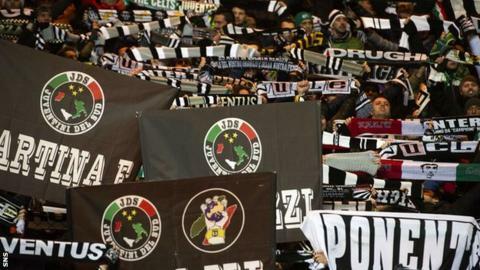 They know that 99% of the time Juventus will make it to the quarter-finals of the Champions League on Wednesday night. But, just sometimes, things can go wrong. Tuttosport - the Turin-based sports paper - says that only once in the history of European football has a side overturned a 3-0 home defeat. It was Dynamo Bucharest against Slovan Liberec in the 2009/10 Europa League - but the first match had been awarded to the Czech side after a pitch invasion in Romania. Curiously enough it was former Juve player, and an old acquaintance of Scottish football from his time with Dundee, Dario Bonetti who was in charge of Dynamo at the time. Nonetheless, Tuttosport did not rate the chances of a similar upset at the Juventus Stadium likely. "The convincing win recorded against the Scots at Celtic Park should allow Antonio Conte's men to rest easy," it said. "The great comebacks of European football have usually been achieved in games played in front of your own fans. "One example was Deportivo La Coruna at the Estadio Riazor who turned round a 4-1 first leg defeat with an emphatic 4-0 victory." The defeated side on that occasion was an Italian one - Milan - and it included current Juventus star Andrea Pirlo. He was also part of the Milan side which lost a 3-0 half-time lead in the Champions League final against Liverpool in Istanbul in 2005 - a memory which still burns. Despite those occasional historic setbacks, La Gazzetta dello Sport is also understandably upbeat about Juve's chances. "With a little bit of concentration the Bianconeri will go flying into the quarter-finals - something Italy's most popular club has not achieved in seven years," it reckoned. "That was Fabio Capello's side, a great team with Gianluigi Buffon in goals, Fabio Cannavaro at the back, Emerson, Patrick Vieira and Pavel Nedved in midfield and Alessandro Del Piero, David Trezeguet and Zlatan Ibrahimovic up front." The Corriere dello Sport carried a warning from Juve defender Giorgio Chiellini who missed the first leg in Glasgow and will also sit out the return. "There is still a lot to do, we shouldn't think that qualification is already in hand," he said. "On Wednesday we will give our all and any thoughts about what stage we can reach in the competition can wait until after that." Those are the typical words of an Italian hoping to avoid "brutte sorprese" (nasty surprises). However, he did then go on to outline which sides he would prefer to avoid in the last eight of the competition. It seemed clear he was more worried about tempting fate than any genuine concern for a historic second-leg collapse.